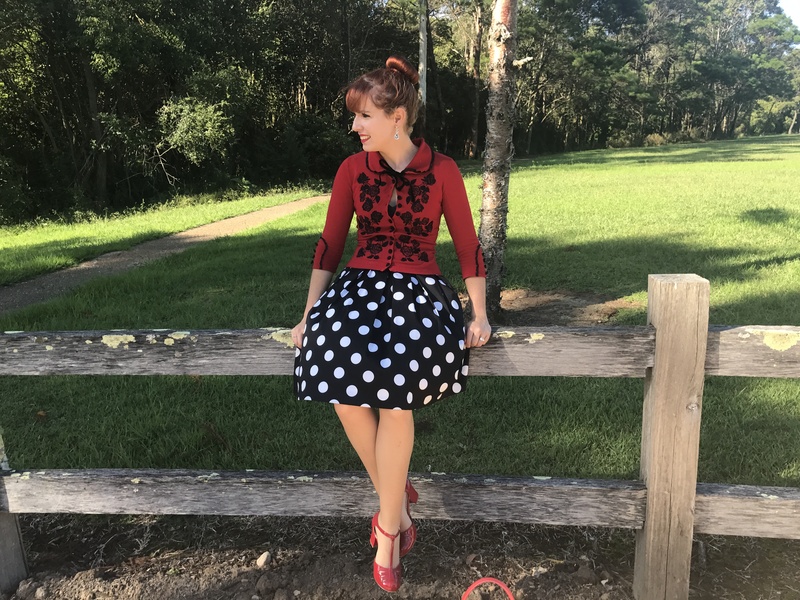 This beautiful red piece is the newest addition to my Wheels and Dollbaby ‘Dita Cardigan’ collection. I adore these pretty cardigans, they are literally my favourite piece I’ve ever owned. My collection now stands at seven and, after purchasing a couple from ebay recently, I’m very satisfied. However, I don’t think my life will ever be complete until the Dita Cardigan is released in a yellow colourway. However, the one aspect of these cardigans I don’t like is the variation in sizing as many colourways fit so differently. I guess that’s to be expected given they’ve been released over so many years. In an ideal world I’d have every colourway fitting exactly the same. This red one is tighter, shorter and smaller than most of the others and I prefer this fit. There have been many different releases of the red version but I believe this is one of the earlier ones because it’s in the old sizing of range of 1-4. 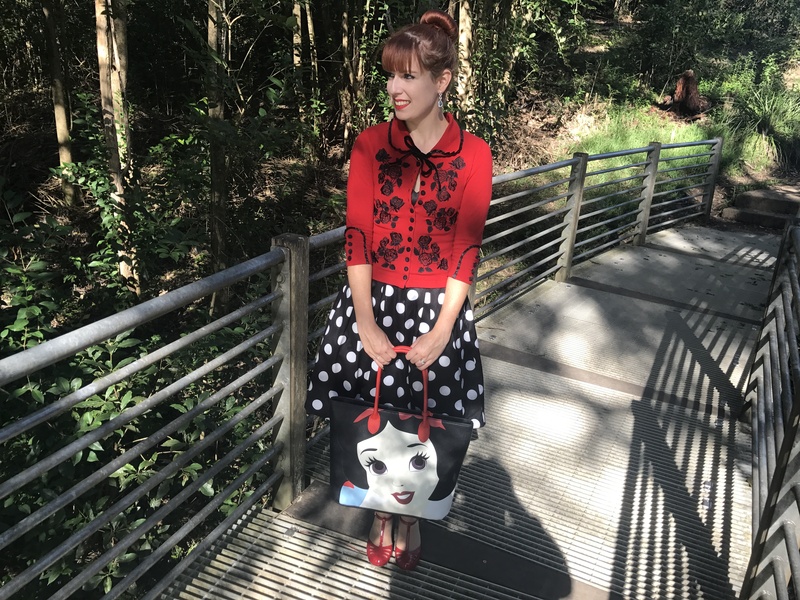 I love wearing red accessories and/or a red cardigan and shoes with almost any outfit. 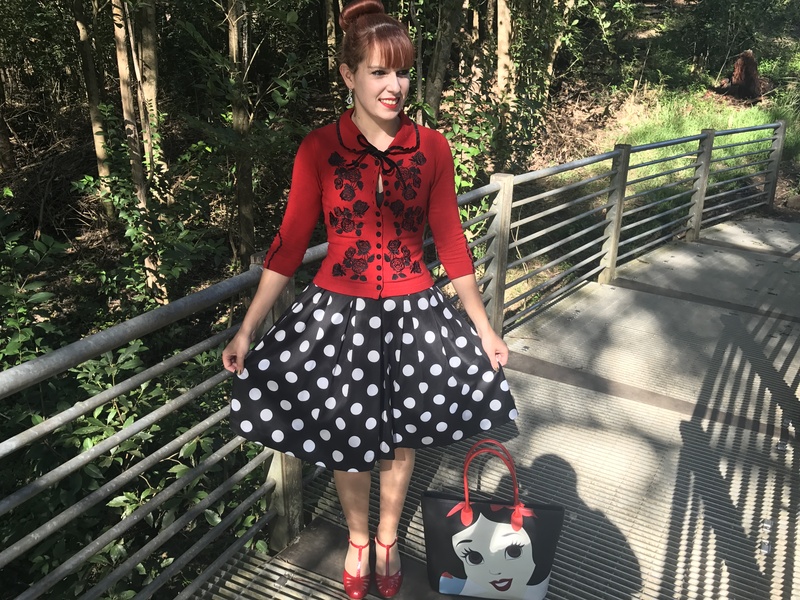 Pairing red with a black and white polka dot combination is a more classic option but the choices are endless. 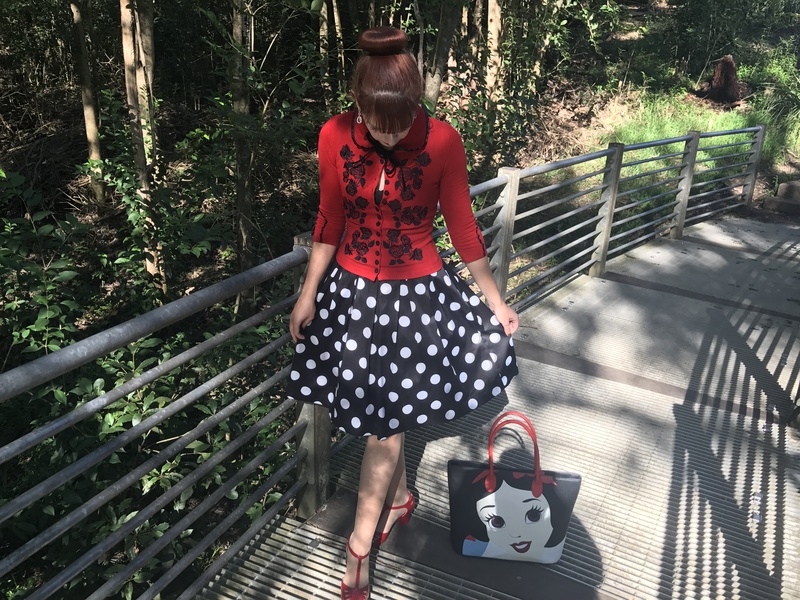 I wore my red Dita Cardigan and red heels with a floral dress the other day which had no red in the pattern. I liked that too. I’ve had this polka dot dress for a couple of years now. I rediscovered it the other week. I’m definitely going to wear it more from now on. The Snow White bag deserves a post of its own. While I was redoing my blog over the last couple of weeks (converting to wordpress and formatting my older posts) I remembered this park where I used to take all my blog pictures for so many years. 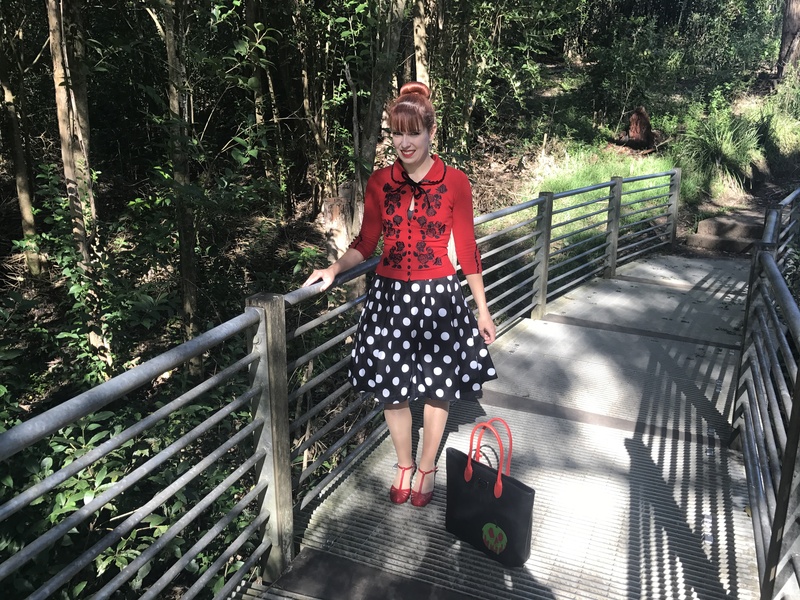 More recently I haven’t come to the park because I’m so busy and favour taking outfit pictures closer to home. However, I thought I’d take a trip to the park which shaped so much of my blog in the earlier days. It took me right back just being in the park. Isn’t it incredible how just being in a physical location can do that?! 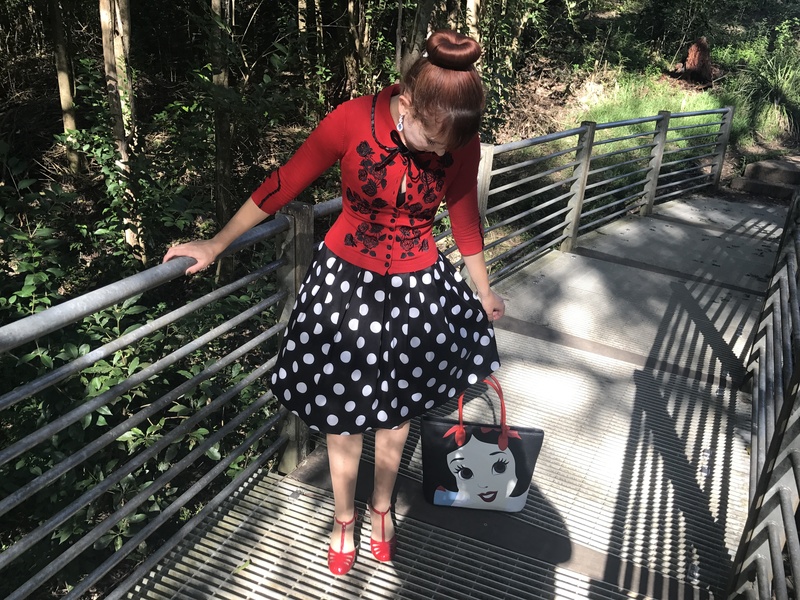 This entry was posted in BAIT Footwear, Loungefly, Outfits, Review Australia, Wheels & Dollbaby. Bookmark the permalink. 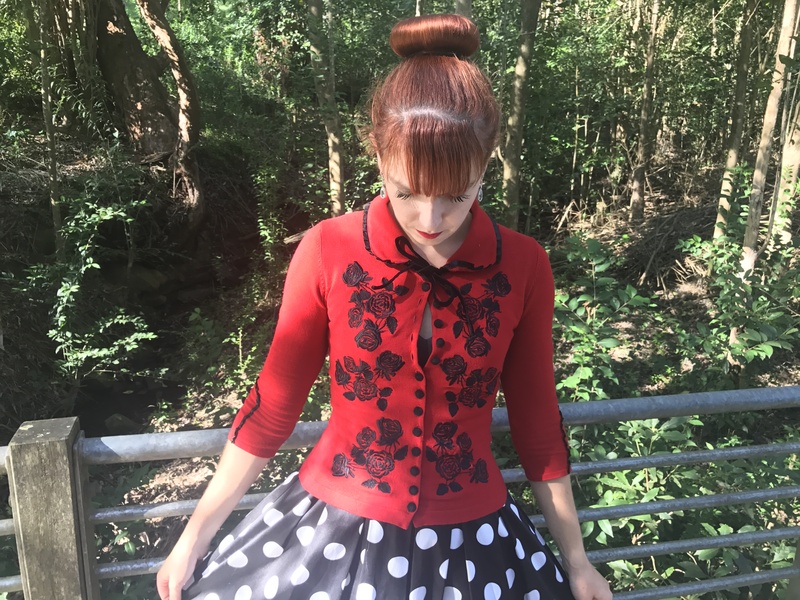 So love this cardi, Imogen, and I can totally understand why you love the Dita so much. And yes! It would be fab in yellow! 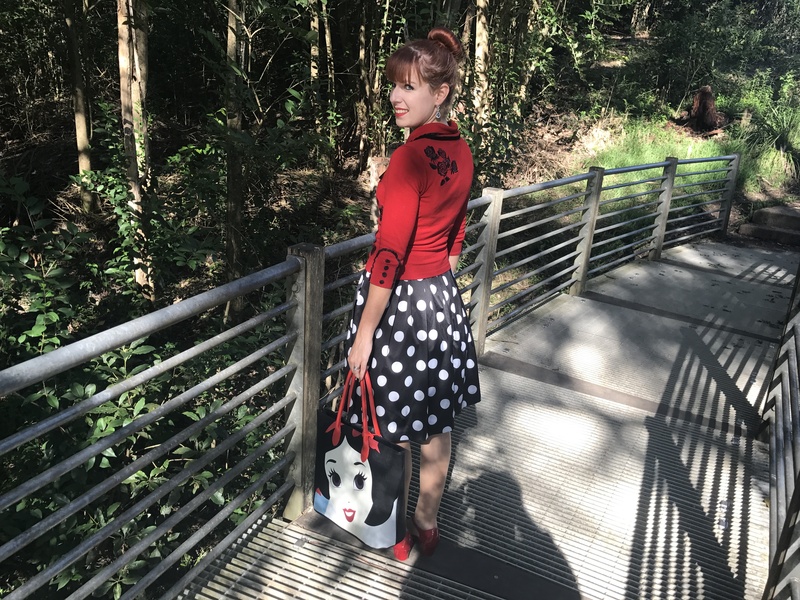 This park is amazing and I love your cardigans! This one is really beautiful and I loved it with the polka dot bottom. I know that these shoes are B.A.I.T., I really want a pair of them! I liked the pictures, I think you always look very feminine and romantic, always beautiful, Imogen! Hope you have a very beautiful day! This outfit is so gorgeous! And your photos look amazing! It is the most beautiful cardigan and really fits you well!